Squeakret mission was supposed to be really meta. It's a game for itch.io where you can browse the actual itch.io jam page it was created for. Unfortunately life got in my way and stripped back what should've been 2 weeks into a few days. The project didn't get very far, but it did end up functional. You can view the different pages, but you can't actually do anything, which is a massive shame. However I still consider this a massive technical achievement. It gets (mostly) live data from the actual game jam page then renders it as in game UI! I'm definitely going to change that. Expect updates. 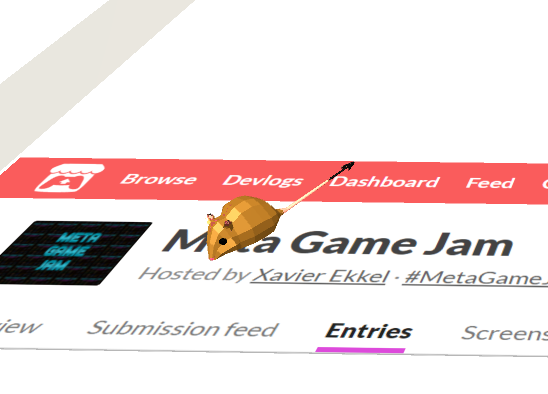 The original goal was that the mouse would be given a mission that required it to explore the game jam page. It was supposed to encourage the player to look at other peoples games. I was going to give game creators a way of embedding secrets in their game pages. This is what I will follow up on in the coming weeks.